After a period of unavailability due to legal challenges, I am happy to announce that the app formerly known as “Shush” is available once again. It’s now called “Swish.” You can check it out on the iOS App Store. 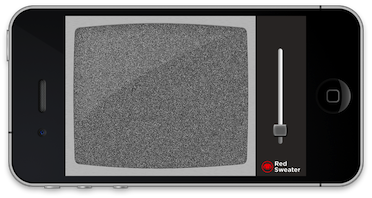 Swish is a minimalist static noise generator, producing both static white noise (actually, pink noise) for your ears as well as visual white noise along the lines of what some of us remember from the television sets of our youths. I came up with the idea for Swish in 2008, after my oldest son Henry was born. Static noise is soothing to many babies, and with the crying fits I was enduring, it seemed worth a shot. It did the trick for Henry, and has helped many other parents looking for an “always in my pocket” soothing source of static. Shush seemed the perfect name, because it embodies not only the verb meaning of trying to quiet somebody, but the sound of the static noise itself. Because it was a whimsical side-project, I never expected to make a ton of money off Shush. And I haven’t. However, I maintained the app over the past 8 years, and released a major update when my second son, Matthew, was born. Needless to say, this project has been personally very meaningful to me. Swish is available for both iPhone and iPad. Before the trademark issue came to a head, I had built and submitted a version for Apple TV. It seemed like a perfect fit to me: I have witnessed fake static that ships with televisions, and is far inferior to the static I’m managed with some OpenGL tricks on iOS. I stripped the faux-television chrome from the UI and was left with an app that simply makes static when you launch it, and stops when you quit. Apple deemed the app too simplistic and suggested that I add more functionality. I continue to stew on that advice, but in the mean time, at least it runs on my television. I have the pleasure of occasionally turning my living room into an absurdly, amusingly vintage static noise environment, very reminiscent of my youth. This entry was posted to Apple, iPhone, Red Sweater News, Shush. Both comments and pings are currently closed. Thanks for reading!